It’s the middle of the week at this point, and if you are in need of something that’s new and heavy, we have a song for you. “Enslavement to Torture” comes from Assault’s album The Fallen Reich, which comes out today, May 10th, via Transcending Obscurity Records. The album contains artwork from Mark Riddick, and this very track includes guest vocals from Freddy Lim of Chthonic. If you like what you hear, you can order the album by clicking HERE or the Bandcamp widget below (as well as check out another track). “Enslavement to Torture” is a wicked slice of death/thrash that doesn’t relent over the course of its runtime. A slower and somewhat groovy riff starts things off before the thrashing kicks in and takes off with high-octane speed. Despite the intensity, there’s still plenty of room for melody along the way – be it a real scorcher of a solo towards the end of the song, or within the riffs themselves – which is what will draw listeners back to the album over and over again. Death/thrash has a necessary aggression component, but it’s stronger when the band can squeeze in some melody as they do here. 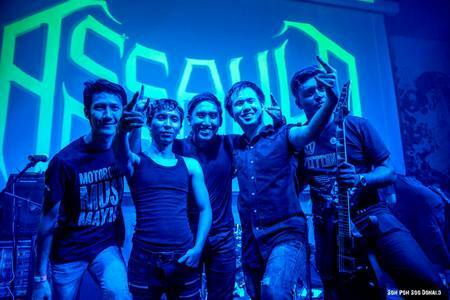 ASSAULT are Singapore’s best kept secret. They’re playing scintillating death/thrash metal with rare ferocity coupled with melodic sensibilities in a way that the intensity remains unabated throughout. With guest appearances from notable band members of CHTHONIC (Taiwan) and NOTHNEGAL (Maldives), they’re touted as one of the best emerging bands from Asia. Additionally, The Fallen Reich features artwork from none other than the world renowned artist Mark Riddick. It’s certainly one of the most exciting and promising albums in recent times and will set new standards for bands in their region.